Ophthalmometry - measurement of the radii of curvature of the cornea using ophthalmometry (Fig). The study produced in a darkened room. 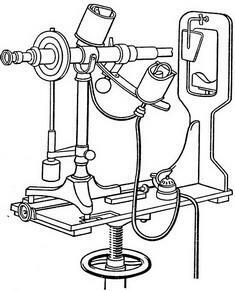 Studied puts his chin on the stand of ophthalmometry; the device is set to on cornea investigated eyes turned out to the reflection of the light of the figures, one of which has the form of a ladder, the other rectangle. By means of the screw lights on the arc of the unit shift or pushing up until reflected on the cornea average length figures will not come in contact with. Arc device counts the radius of curvature of the front surface of the cornea in millimeters. To determine the degree of corneal astigmatism (see Astigmatism eye) is brought into contact reflected figures in the horizontal Meridian, then turn the arc of the device 90 degrees. Largest slipped on easily or discrepancies figures determine the degree of corneal astigmatism in diopters: each rung of the ladder of light figure corresponds to one diopter (see). R=2 Вα/A, where a is the value of the subject, see reflected in the mirror, and - the value of mirror image, and In the distance of the subject from a mirror. The acting is reduced to the measure of the image of object on the surface of the optical medium of the eye. The greatest application have received ophthalmometer of Zavala-Setca (Fig. 1). Ophthalmometry spend in a dark room. The head of the investigational fixed on a special stand. After switching the lighting system of the device and its correct installation on the cornea of the investigational eye produces images of two figures - ladders and rectangle that the doctor sees through the eyepiece telescopes. With the help of special screws both figures move before contact with each other. At this moment, the measurement scale counts the radius of curvature of the front surface of the cornea in millimeters. Ophthalmometer can also determine the degree of corneal astigmatism and the direction of its main meridians. Initially achieve touch figures and overlapping lines, dividing each of them in half. This setting corresponds to the position of one of the main meridians, defined on a scale. Then the device is turned on 90 degrees per second position of the main Meridian. While figures either disagree or find each other. The degree of slipped on easily ladder on the rectangle judge about the degree of corneal astigmatism: each rung of the ladder matches one diopter (Fig. 2). Fig. 2. Location figures corneal image if ophthalmometry: 1 - figures are divorced; 2-original position figures in the beginning of the study; 3-8 - position figures astigmatism-direct (3), reverse (4), with diagonal axes (5-8).